Greetings one and all - how has the international break been for you? Did you go to Wembley for England's resounding win over the Czech Republic? Did you try out some non-league football for the first time or just get more confused and/or frustrated by all the Brexit shenanigans? It's been a great weekend for some of our local non-league sides with Leyton Orient and Cray Valley PM both making it to Wembley for the finals of the FA Trophy and FA Vase respectively. Chertsey Town have just finished the first leg of their Vase semi-final and will be very optimistic about making it to the national stadium too after drawing their tough looking away leg against Northwich Victoria 1-1. Tickets to see all of them take part in Non-League Finals Day on Sunday 19 May are already on sale and I can assure you that it's a great day out. It's £25 for adults but only £12.50 if you get a group of mates together which is what I'm doing - remember, that's the drama of two cup finals back-to-back for that great price. I've been entertaining some old friends from overseas over the last few days so haven't been to any games but I did learn that I've won a community award from QPR which will be presented to me on the pitch at half-time during the Bolton game on Saturday. 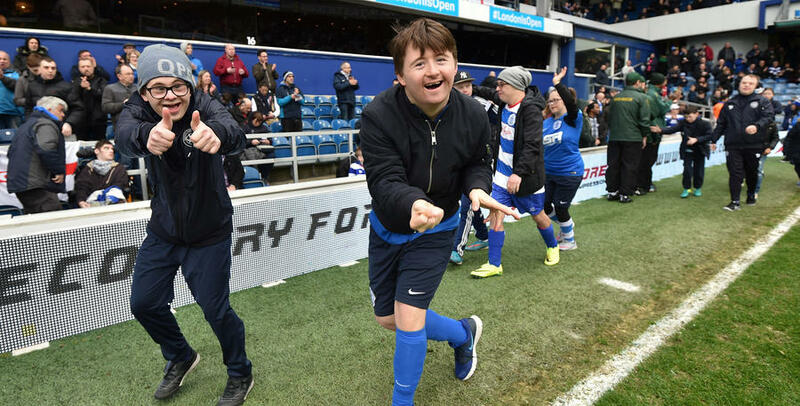 Back in 2010 I helped to set up what has become an annual supporters' fundraising walk on behalf of the QPR Tiger Cubs - a sports club for children with Down's syndrome. I'm not sure of the exact amount raised over the years but it's topped £100,000. Most walks have started at Loftus Road and headed crosstown to a derby match with walks going to games at Crystal Palace, Watford, Tottenham, Arsenal, Charlton, West Ham and Fulham. The other years have seen us walk from QPR's training ground near Heathrow to a home game and we'll be doing that this year too. With it being the 10th event, a real effort is being made to get people involved and donating with other walks being undertaken by fan groups abroad so hopefully we'll get a really decent amount. In other news I'd like to give a mention to Essex Senior League club Barkingside who are celebrating their 120th anniversary with a friendly against Clapton CFC on Monday. They've had a tough year resultswise so a big crowd for this match would mean the world to them. As mentioned a few weeks ago, nominations and voting are now open for the 'Football Blogging Awards'. There are many fine blogs including other local writers like 'The Cold End' and 'Two Men In Search of The Beautiful Game' who have made a huge contribution over the last few years. The highlights of the next few days include matches in the Premier League and EFL, an FA Vase semi-final and loads of games in our local non-league competitions too.